Chomthana welcomed students in the field of food business and nutrition from the Faculty of Agriculture, Ubon Ratchathani Rajabhat University to learn more about the food business. A total of 30 students visited the factory. It was a great opportunity for students to gain an understanding of the production and food industry management processes. We hope the visit was helpful to them and can open their eyes to new opportunities and innovations within the food industry. Chomthana Thailand is very grateful to Central Thailand Mission for the opportunity to take part in their annual Christmas Charity event, where children from various homes experienced the joy of eating our ice cream. We hope to take part in more fun activities together with Central Thailand Mission again soon. We are looking for distributors nationwide! Looking for an exciting business opportunity? 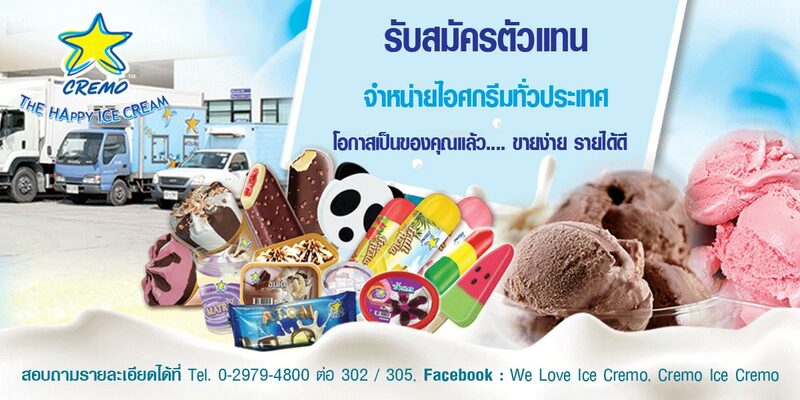 Cremo Ice Cream is looking for distributors nationwide! Contact us at 02 979 4800. (ext 302, 305) for more information. This last Saturday, Chomthana got a chance to do good for the king by giving Cremo ice cream to people who came to show respect to His Majesty the King Bhumibol Adulyadej at the Royal Palace. And we are very happy to have Mr. Ken, a drummer of the band ‘Zeal’. And Miss. Looktarn AF2 accompany us in this event. Thank you. Thank you to our guests from Johor Bahru Chinese Chamber of Commerce for visiting us and sharing their business experience. Chomthana would like to give special thanks to mission leader Dato. Loh Liam Hiang and his team for their friendly visit.